1. Place the Garlic, Chilli, Oil, Lime juice, Salt & Pepper in a large mixing bowl. Whisk together until fully combined. 2. Dip the Prawns into the mixture and place onto a sheet of tin foil on a baking tray. 3. Brush any remaining mixture on top of the Prawns and refrigerate for 15 minutes. 4. 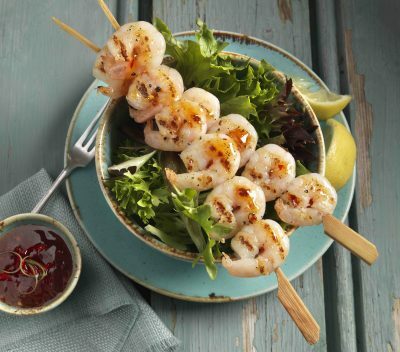 Place the Prawns under the Grill and cook for 2 minutes on each side or until cooked thoroughly. 5. Serve on a bed of Salad & enjoy.